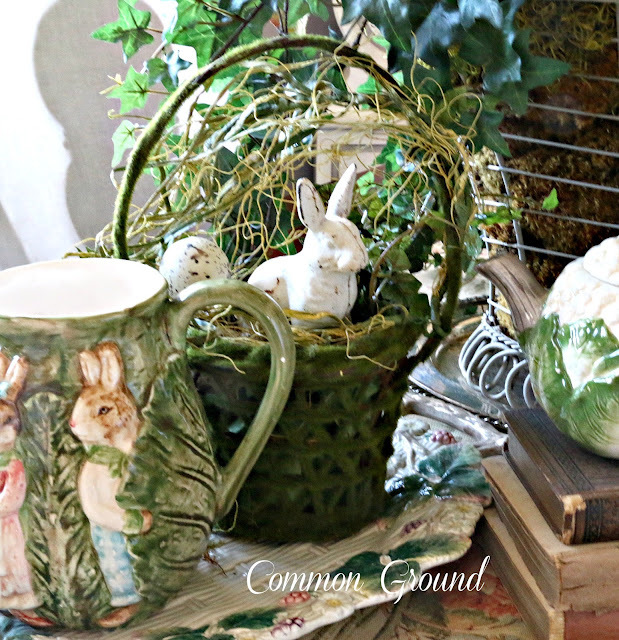 common ground : First Glimpse of "Spring"
Since tomorrow is March, and Easter is coming early this year, I thought I'd get started on bringing a few Spring Things out of the tubs and boxes. This is just my starting place... on the Dining Room table, which is usually where all my seasonal decorating begins. you get dust "bunnies" on your lens! to group with my vintage Fitz and Floyd fois bois Raspberry Platter. even if they're not the real thing. I've kept this heavy wrought iron basket on the table since I repainted it last year. 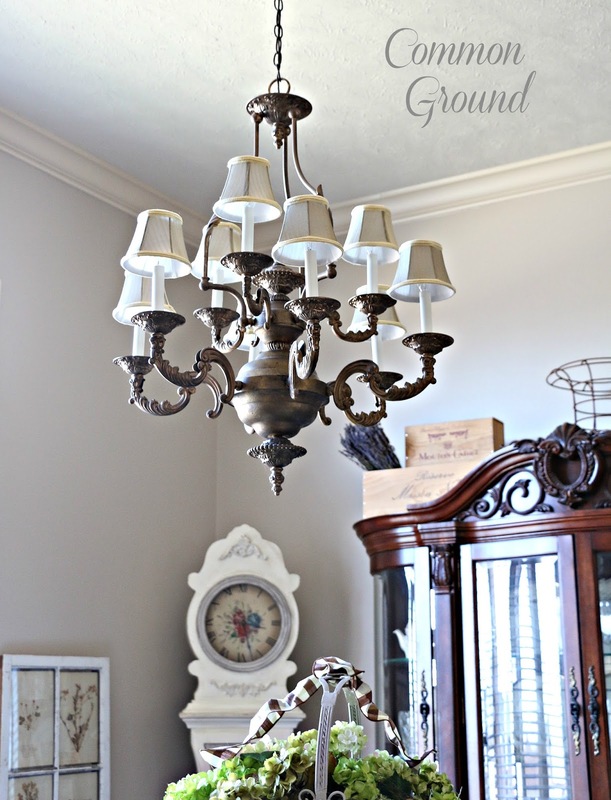 It has the "presence" to compete with the size of the table and the ceiling height. to the Ivy and Hydrangeas that are already here. ...right now I have a large nest with decorated eggs. While going through decor boxes I found my lampshades for the chandy. and they soften it up a bit to look a little more cottage-y. do you have a jumping off spot too? Have a great week, Debra. ha ha, that sounds just like me. It gets worse the older I get. ouch. Debra, I love your faux Majolica! I'm always thinking I'll buy some and then think, "Do I need any more stuff?" But it's so pretty in the Spring. Your basket is one of my favorites. It's country and simple but has so much presence. 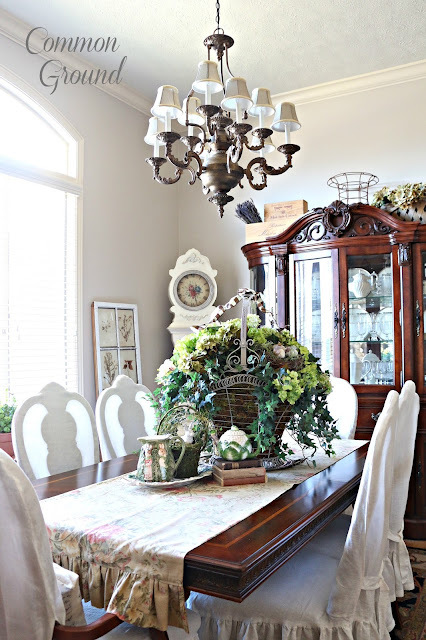 Your dining room looks beautiful, as always! Beautiful vignette Debra, so charming. Both organic and elegant. 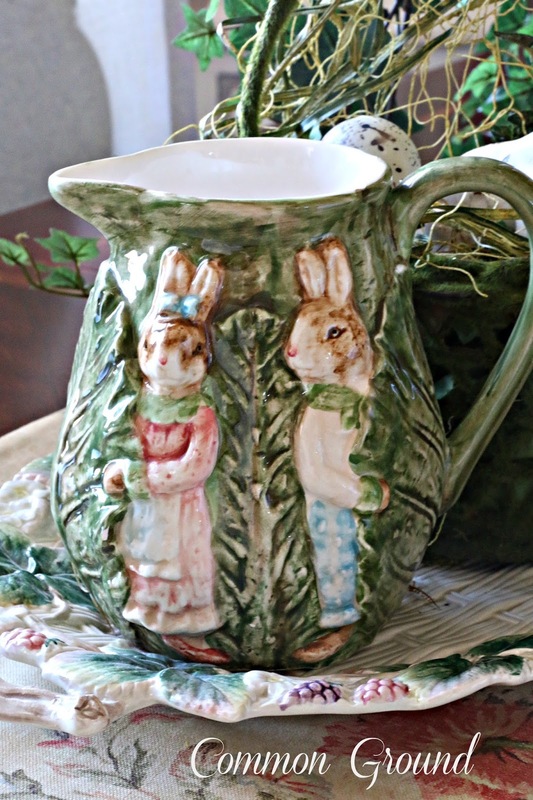 I like your "faux" majolica items. I used to have some of that myself when I decorated with a lot of color. They certainly blend in nicely for some Spring time cheer. I can't believe it's already March! 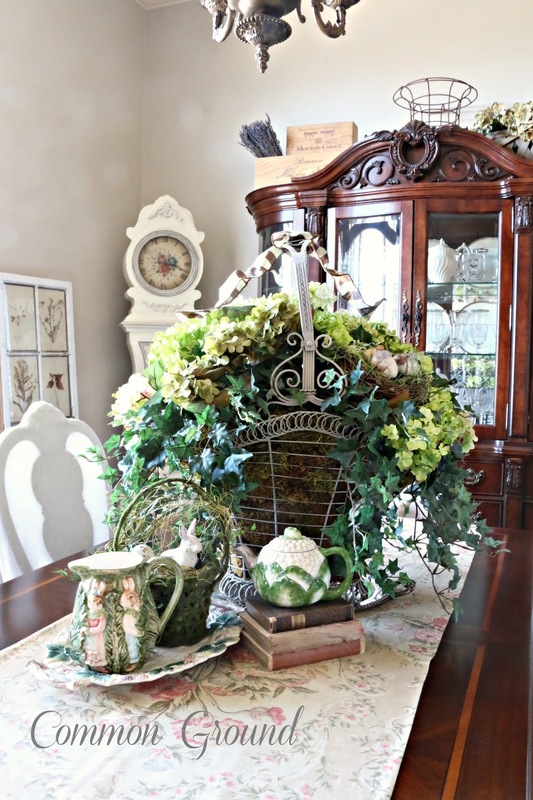 Oh Debra...you always create the most stunning centerpieces for your dining room table....I always find myself studying each and every inch of it!...and yes, I am so ready for Spring in the house! I love your Easter pretties! I didn't have one Easter bit of decor until I bought a couple at the grocery store last week. I need to work on Easter stuff! Very pretty and springy, Debra! I love that little pitcher with the bunnies. 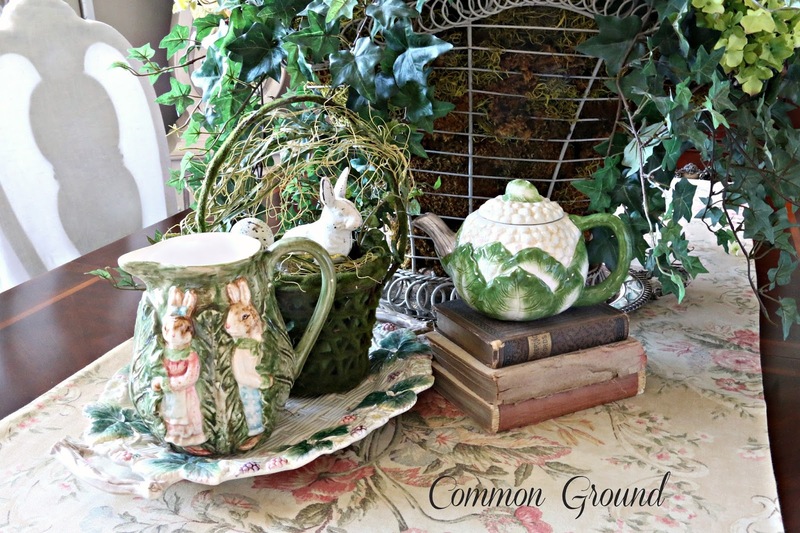 Such a great vignette to start off with. I need to get up to the attic and get my Spring stuff down. I've got some ideas going through my head and am looking forward to seeing how they look in reality. Of course, we have snow showers in the forecast, so it might help to make it feel springy inside! Everything looks beautiful and I love the bunnies! I am glad to see you back on here. We are in the middle of a snow storm!! Thank you for sharing all your spring pretties at my party (I need to get mine out ASAP). 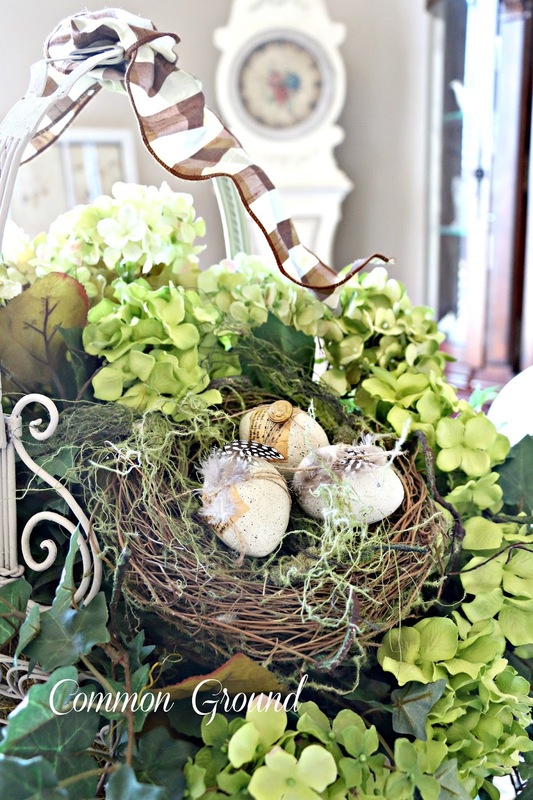 Love your eggs decorated with feathers! 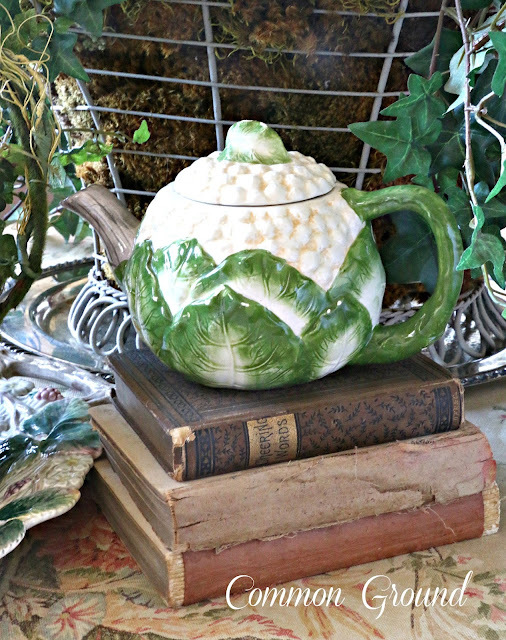 The faux Majolica pitcher and tea pot are quite charming, dear friend! I adore your nest within your basket, too! That table runner is gorgeous! Beginning Spring started in the Dining Room for me, also, this year. Time to take some photos! What a pretty arrangement, Debra! I am always inspired by what you create! I had to laugh about the dust bunnies...if I don't put my glasses on, I don't even see dust...that goes for wrinkles, too lol! Debra your dining room looks stunning! So ready for spring. I am working on mine...thanks so much for the inspiration! So much eye candy. Lovely spring inspiration. I'm ready for it. I love your springboard. So cute. The little bunny is adorable. I love the faux majolica. The real thing is gorgeous too but so pricey. It's great to see you feeling more yourself. I'm so glad it is March. 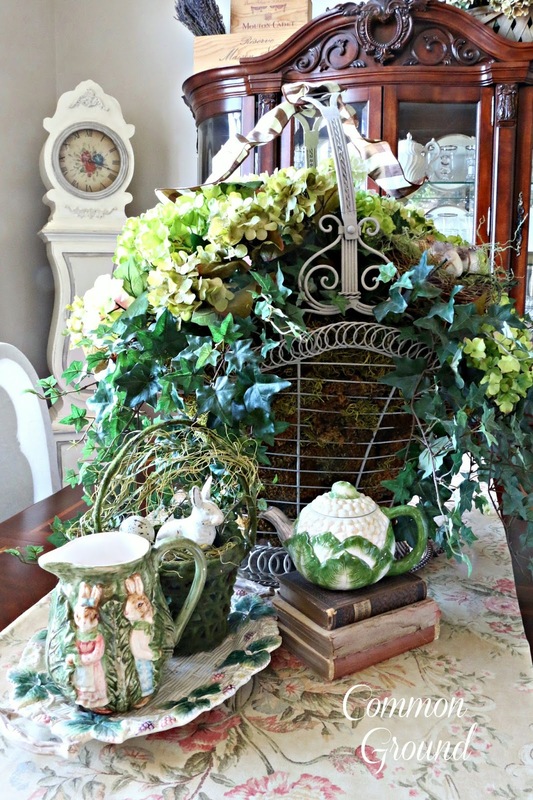 Your Spring tablescape is just beautiful, Debra, and I adore your dishes! So pretty Debra!!! Your dining room is always so beautifully decorated.